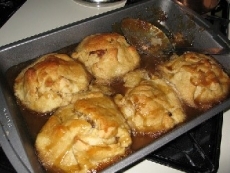 Have you made Apple Dumplings? 1. Combine sugar, water, cinnamon and nutmeg in a medium saucepan. Heat over medium heat until mixture becomes syrup; add butter. 2. Pare and core apples; cut into fourths. Sift flour, salt, baking powder into bowl. 3. 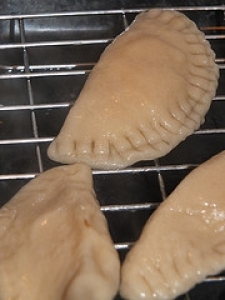 Cut in shortening with a pastry knife (or a regular table knife) until mixture becomes crumbly. 4. Add milk all at once and stir just until moistened. 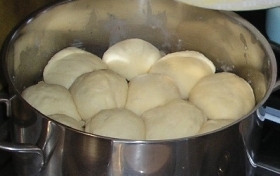 Roll dough out to 1/4 inch thickness. 5. Cut dough into 6 - 5 inch squares. Arrange 4 pieces of apple on each square and sprinkle with additional sugar, cinnamon. 6. 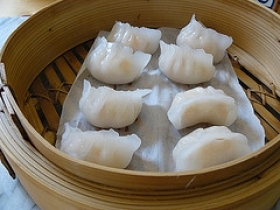 Fold corners to center of each square and pinch edges together to seal dumplings (make sure they are sealed tightly and no apple is sticking out!). 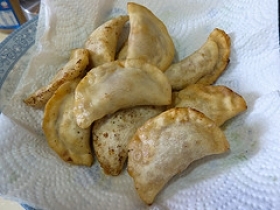 Place dumplings in buttered baking dish. 7. 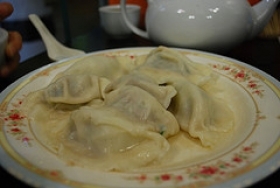 Pour syrup over dumplings. 8. 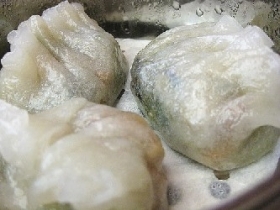 Baste dumplings with the syrup once or twice while baking.